Spring, I don’t know what your deal is but in the interim, what a great way to spend a sunny Saturday by over indulging in grilled cheese sandwiches. Yes, I speak of The Big Cheesy event over this past weekend and here is the skinny on how it works. As soon as you enter, and after you check in, they give you a ticket for a free local brewsky. Then, the party begins. If the intense scent of melted cheese does not excite you, then the best thing to do is to leave…but you should stay for the experience. Local companies and restaurants battle it out for two days to proclaim the ultimate prize- the best grilled cheese in NY. This is an honor; sort like the Oscars of sandwiches. If you like what you taste, then you drop a bright orange ping-pong ball into the company’s canister. Warning: you only get one, so the best suggestion is to sample everything if your stomach can handle it. Additionally, because it gets super packed, you only have an hour until the next group comes in. After a few samples, the decision dwindles down to two choices and personally, everyone is a winner. 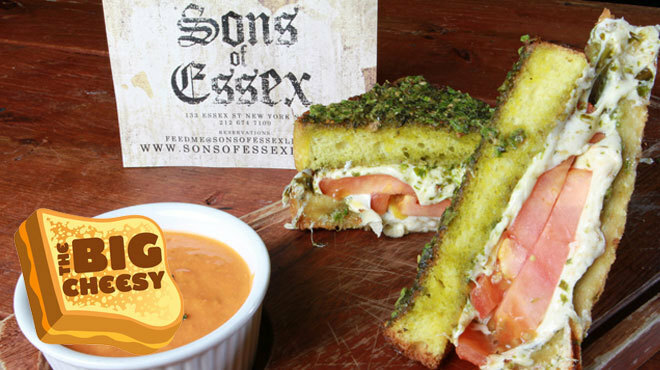 However, my vote goes to the Truffle Grilled Cheese masterpiece from Sons of Essex restaurant in NYC. Sadly, it’s an annual event and if you missed it this year, then mark the calendars and get tickets in advance for next year and I will see you there.